Ring a change by the scenic mountain road TF342 for getting around Tenerife. The mountain road TF342 with its breath taking views towards the Tenerife coast with towns, villages and Atlantic is spectacular. Nevertheless, it is not the only one nor the only method to get from north to south. At least almost. But lets talk about its 'short-come' later. 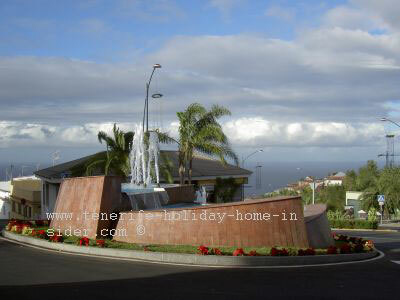 Indeed, Titsa bus lines often follow different Tenerife bus routes from the oldest resort. But the TF342 is an excellent option to get from Puerto Cruz to Los Cristianos, Playa de las Americas, Costa Adeje and even to El Medano. Certainly, most credit deserves the uttermost luxury and best mountain road of Tenerife. That's the Tenerife Cordillera of the Teide Highlands which is depicted with Spain's highest Peak Mount Teide on the horizon. 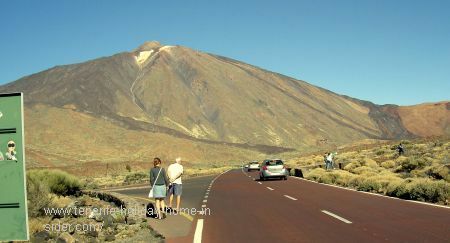 Much has been written about Tenerife's most admired road by the crater and mountains. Therefore, let me help you to explore Tenerife more off the beaten track. And that is by route TF342. Realejos fountain where the road leads to the mountains. Beside see a modern Los Realejos fountain by Puerto de la Cruz Tenerife. This landmark is your clue for catching an alternative road for getting around on mountains. This fountain which was built sometime between 2007 and 2010 is beside the post office. There, Calle San Agustin and Ave. Canarias join below the town hall. Behind this water feature are two roadsigns. One points you to Cruz Santa on a mountain highway in the left hand direction. There, you must still climb Ave.Canarias. The alternative is a yellow and white billboard in front of a grey modern building. It shows the way to Icod del Alto and La Guancha. Once, by the old Church Matriz de Santiago on your left, remember to have to cross the Realejos gorge on your right to get to higher grounds. There is another indication by the church, though, which reveals the way. It gets you to the petrol station by Madre Juana, to Icod el Alto and then to the hamlet la Guancha. You cross the ravine Barranco Ruiz just before Icod del Alto with its breath taking, awesome Tenerife views. 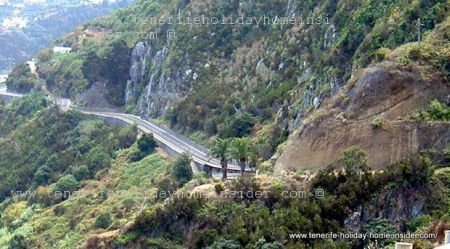 There is a stretch of the mountain road TF342 of Icod Alto of Los Realejos by the stunning look-out El Lance. 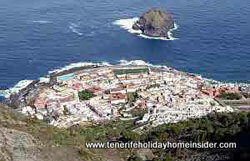 It is still known as part of other Tenerife mountain streets which made up the famous Camino Real. Mind that the latter was joining important settlements by rough country roads which were good enough for horses, donkeys and man. La Laguna, Tacoronte, Santa Ursula, Los Realejos and many olds road of the south for were part of it. The historical, big farm Hacienda la Pared of Icod el Alto was an important country inn for the old Kings' mountain road in the past. It is still much talked about because of its generosity and its history of potatoes. Meantime, the TF221, which was once part of Camino Real is now connecting Icod el Alto with La Guancha. Most challenging mountain road path for paragliding and more. Stop at the Icod del Alto Look-out to get onto the steepest, longest Tenerife mountain trail called Route 0-4-0, Rambla Ruiz or call it a path for hiking. It leads virtually straight up for 10 km to get you to the Cañadas. It sounds terrible to me, but may be a great endurance challenge for some gutsy, fit Tenerife tourists. You can also get to la Corona from Icod Alto for sightseeing or for paragliding which is one of true attractions of Tenerife. Consult one of the following Tenerife maps by clicking here to find your way to La Coruna very fast. Follow the TF342 past la Guancha until the road becomes coastal for a while by the route 362. Proceed past Icod de los Vinos and Garachico with famous mountain road view. Way back in 2001, my family traveled on this road by bus to do shoppig in Garachico. while sightseeing all the way. Do as we did and enjoy the views from high up. This is mountain scenery in reverse with the mini mount of the Garachico rock as one of the highlights. Then, get on to Los Silos and to Buenavista del Norte. Unforgettable TF436 mountain serpentine via Masca to Santiago del Teide. Climb the most scenic mountain road TF436 which is loved for endurance cycling off Buenavista del Norte. Consult the map Buenavista del Norte to find indications on how best to proceed to get to Playa de las Americas via Los Gigantes. 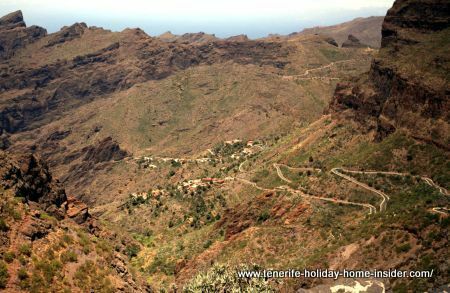 The road map also depicts some of the Masca Massif with the most picturesque mountain village more of which see here together with awesome mountain route bends. A rented car with poor pull and power can be very frustrating on this steeply climbing road. From mountain road back to Los Realejos which is all about this town and region by Puerto de la Cruz.